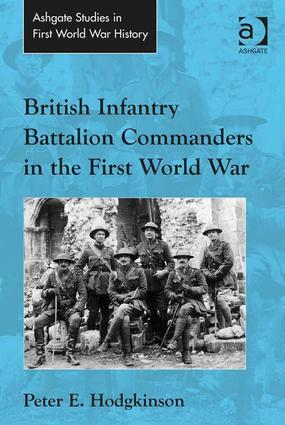 Introduction; Old contemptibles; Dug-outs; Attrition and change in command; Evolution of command in the integrated army; Hiring and firing; ‘Men to be followed, feared and loved’; ‘Professional men of war’; The hundred days: meritocracy in command? ; Conclusion; Bibliography; Indexes. Peter Hodgkinson is a Clinical Psychologist with a life-long interest in the First World War. He was one of the first graduates of the MA in British First World War Studies in 2006, and subsequently studied for a PhD in the Department of War Studies. He is the author a range of psychology articles and the book ’Coping with Catastrophe’ second edition (Routledge, 1998); and of ’Clearing the Dead’, in the online journal of the Birmingham University Centre for First World War Studies, Sept. 2007 Vol 3:1; and ’The Infantry Commanding Officers of the British Expeditionary Force of 1914’, in S. Jones ed. ’Stemming the Tide’, to be published by Helion (2013).